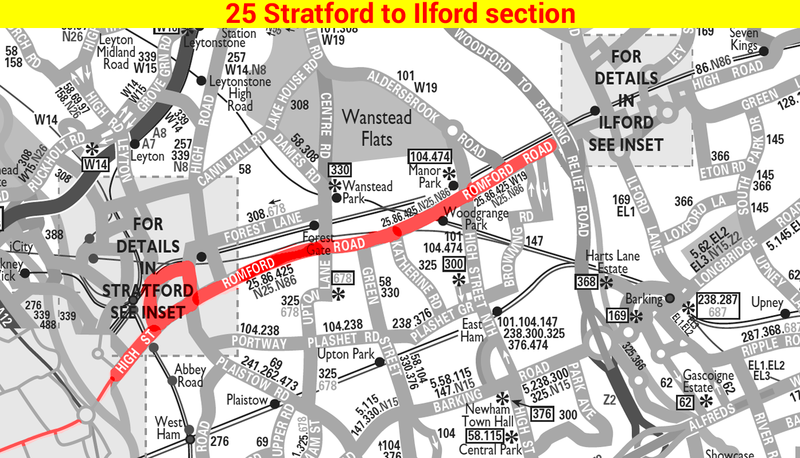 The route previously Stratford to Little Heath was renumbered 25A. Sunday (CL) Clay Hall allocation introduced. Withdrawn between Becontree Heath and Hornchurch. New Mon-Fri peak Route introduced between Dagenham East and Fords replacing experimental Route 193. Clay Hall (CL) garage closed - buses and duties transferred to Bow (BW). Forest Gate (G) allocation withdrawn with garage closure - new West Ham (WH) allocation introduced. West Ham (WH) allocation of RT's replaced by RT's. West Ham (WH) allocation Sunday buses changed to RM. Routemasters introduced on a daily basis. RML type introduced at Bow(BW) on Sundays spare from Route 8. Fords works journeys restricted to a few projections from & to Becontree Heath. RML type introduced at West Ham (WH) on Sundays. 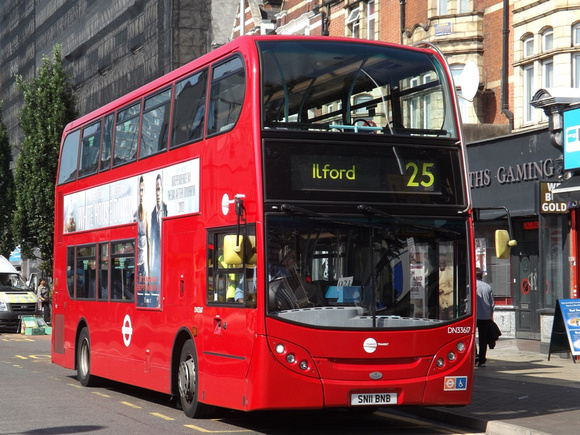 Sat and Sun Route re-introduced between Oxford Circus and Victoria. Withdrawn between Ilford Broadway and Becontree Heath - this section replaced by new route 225. Mon-Fri Seven Kings (AP) allocation introduced with Titan Crew buses. Mon-Fri Seven Kings (AP) allocation withdrawn. Mon-Sat West Ham (WH) allocation transferred to Bow (BW). This was a series of re-allocations connected with the closure of Poplar (PR) garage. Sat and Sun Route diverted between Aldgate and Bank via Tower of London. Mon-Sat West Ham (WH) allocation re-introduced. Mon-Fri early journeys extended to Fords - replacing withdrawn 129 journeys . Sat Seven Kings allocation introduced. Sat and Sun Route diverted via New Change and Cannon Street. AP allocation withdrawn. Sat and Sun Route diverted via Lower Thames Street. Changeover point at garage or Ilford.